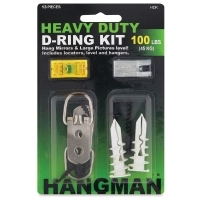 Hang heavy pictures and mirrors with confidence with the Hangman Heavy Duty D-Ring Kit. Able to support artwork or mirrors weighing up to 100 lbs, the Heavy Duty D-Ring Kit includes two large D-rings, two anchors, and two bear claw hangers, plus a bubble level and locators that mark the exact spot for perfectly aligning your artwork. The double-headed bear claw hangers require no drilling or pilot hole, and will not be visible when your artwork is hung. 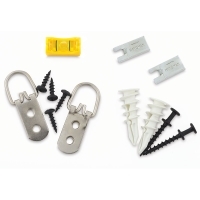 ® Hangman is a registered trademark.